General wisdom says to not fill up on bread before a meal, but I think the rules can be stretched a bit around the holidays, especially when that bread is a fresh Parker House roll. More: When it comes to butter, the Astor House roll rivals the Parker House roll. For this classic recipe, I turned to a classic cookbook: The Fannie Farmer Baking Book. The original recipe calls for shortening, which I know many people like to avoid, so use the non-hydrogenated stuff you can buy at the health food store or just substitute unsalted butter instead. I also cut the sugar and upped the salt just a bit from the original recipe to suit my personal tastes. Traditionally, the dough is cut into circles, brushed with butter, and folded over to form rolls, but I find that method to be a little fussy and have provided an alternate method for folded rolls. 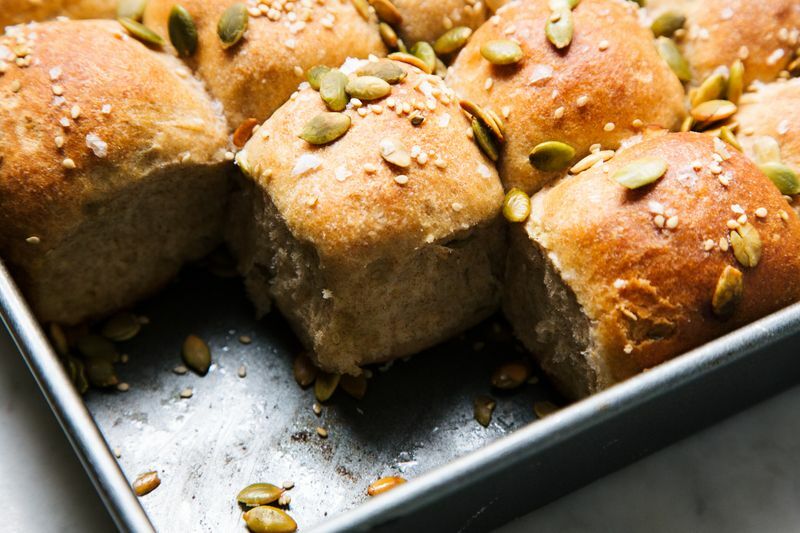 I also had a little fun with a twist on the classic recipe by substituting in some spelt flour and adding salty seeds to the top to make Seedy Spelt Parker House Rolls. They are still soft, slightly sweet, and positively coated in butter, as any good Parker House roll should be. These rolls were shaped as rational rounds, but you could certainly follow the instructions for folded rolls if that is more your style. Either way, you’ll want to serve these warm, with a little more butter on the side. 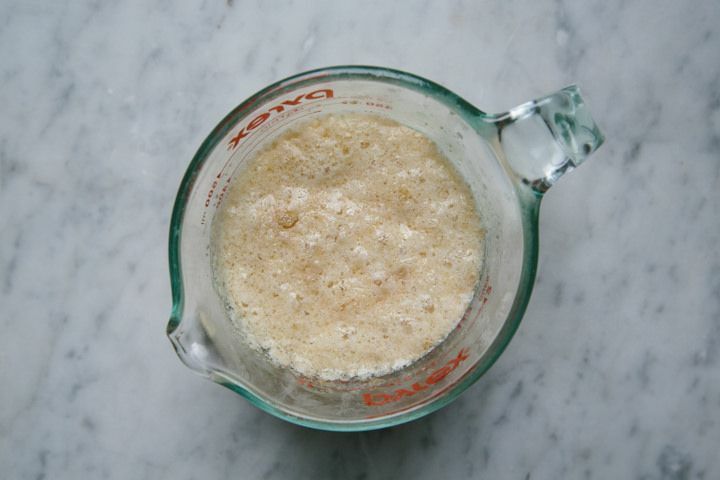 Whisk the yeast and water together and let sit until foamy, about 5 minutes. In the bowl of a stand mixer fitted with the dough hook, combine the shortening, sugar, and salt. Whisk in the milk and egg. Add the foamy yeast mixture and stir to combine. Add the flour(s) and stir until a dough forms, then knead until smooth, about 5 minutes. The dough will be soft and will probably stick to the bottom of the bowl. Transfer the dough to a lightly oiled bowl and let rise until doubled in size, about 1 1/2 hours. 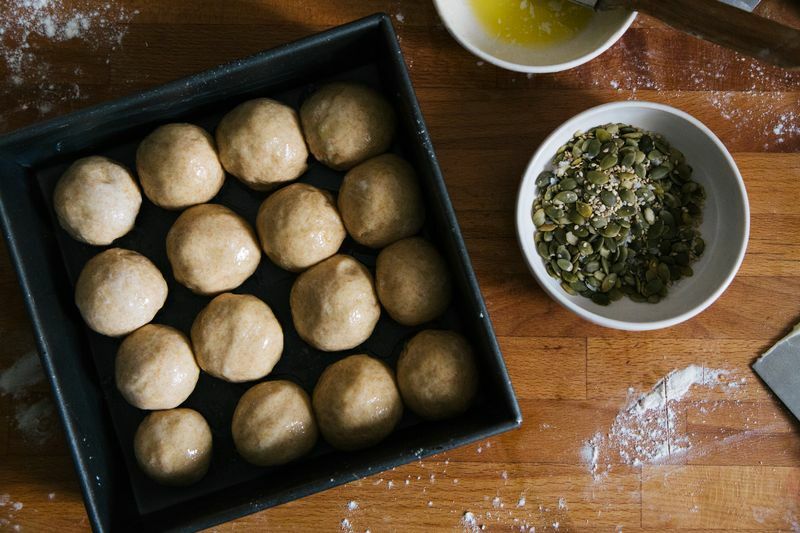 Preheat oven to 350° F, melt the butter, and brush a 9- by 13-inch baking dish (for classic rolls) or a 9- by 9-inch baking dish (for the spelt rolls) with butter. 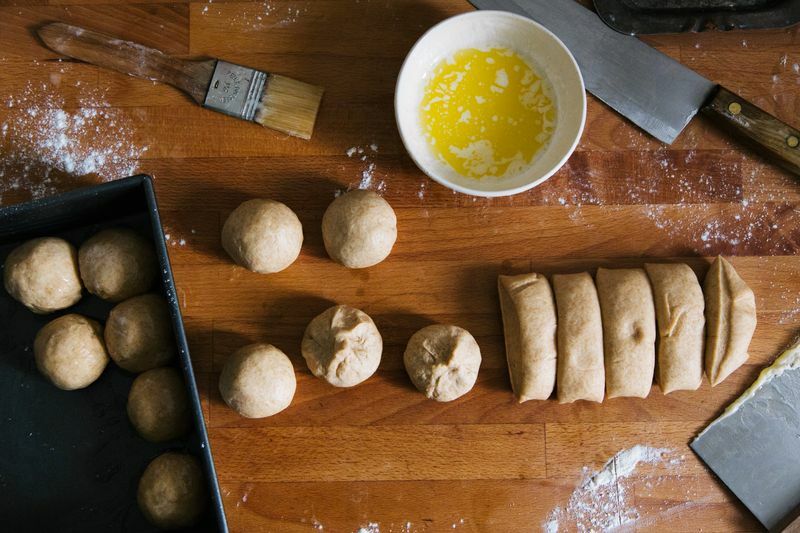 For the classic rolls, divide the dough into 4 pieces. 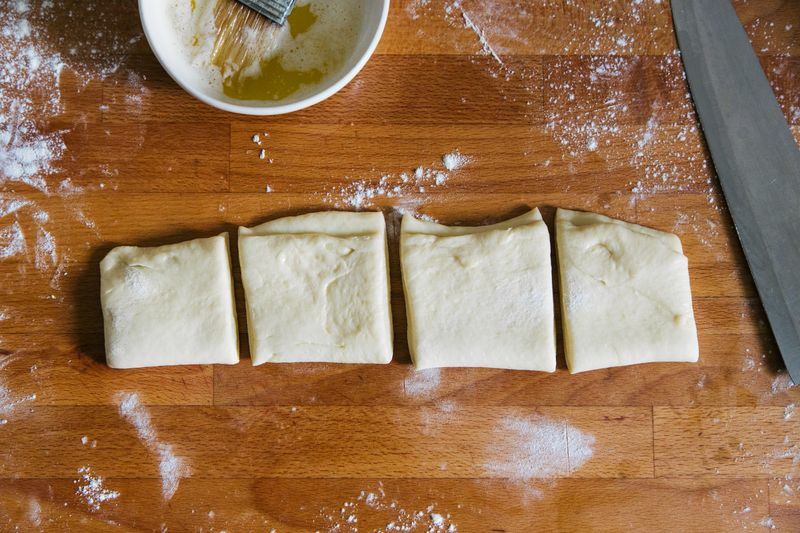 On a floured surface, roll one dough piece into a roughly 12- by 6-inch rectangle. Brush the surface with melted butter and fold the dough over lengthwise. Cut the folded dough into 4 pieces. Lay the rolls in the prepared baking dish, slightly overlapping. Repeat with the remaining dough so that you have 16 folded pieces, then brush all of the rolls with butter. 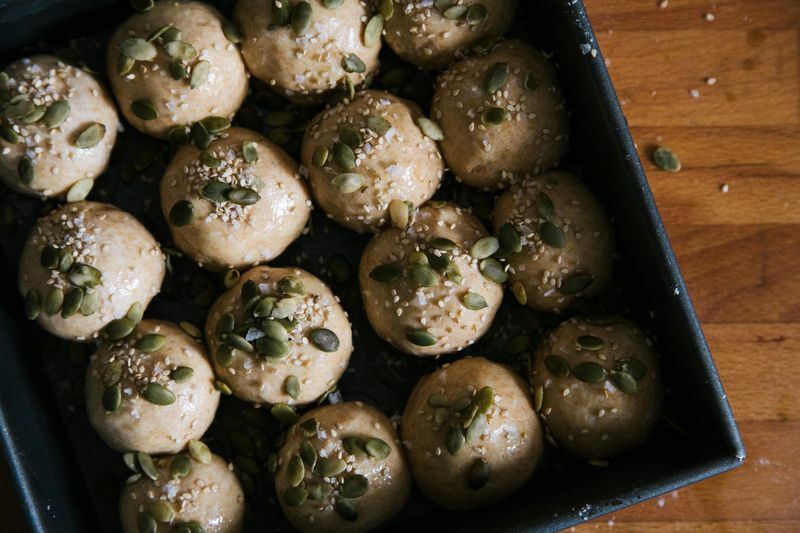 For the spelt rolls, stir the seeds and salt together in a small bowl. On a floured surface, roll the dough into a roughly 16-inch long log. Cut the log into 16 even pieces. Gather the corners of each piece and roll tightly to form a ball. Roll each ball in the melted butter and lay in the pan. Sprinkle the seeds over the top; it's okay if some fall to the bottom of the pan. Loosely cover the pan with plastic wrap and let the rolls rise for 30 more minutes. Bake the rolls until golden brown and puffed, about 30 minutes. 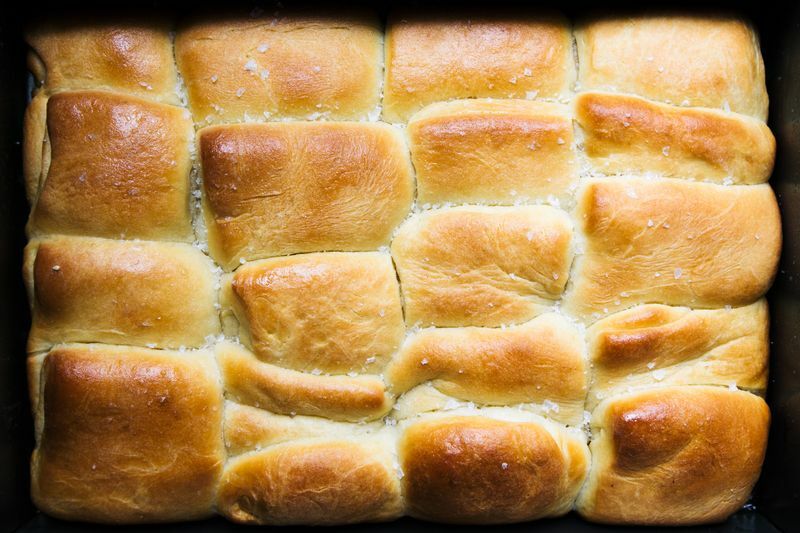 Brush the warm rolls with butter and, if making the classic rolls, sprinkle with the flaky salt. 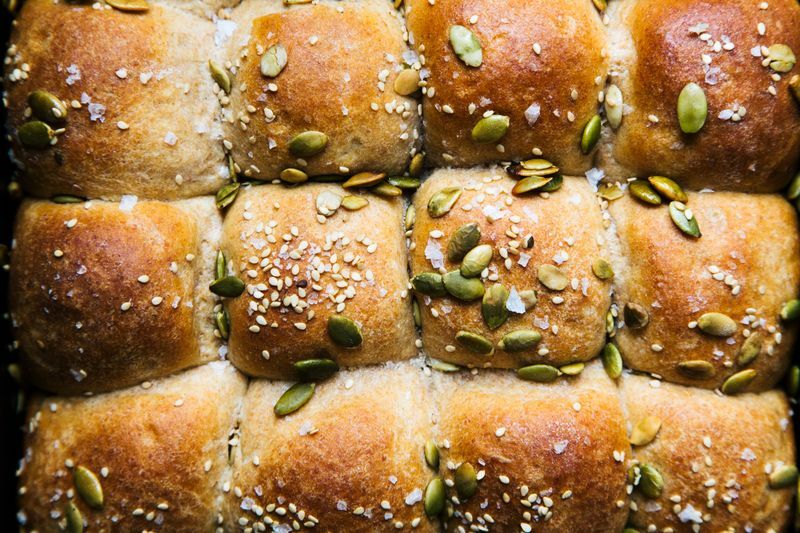 See (and save and print) the full recipes for the classic rolls and the spelt rolls. Can you freeze these and then reheat them the day of? Thanks for the recipe! What effect does using butter instead of shortening have?